Jakarta, 22 September 2015 – As part of its commitment to deliver the best solutions to its customers, Panasonic today introduced the Panasonic Glass Door Refrigerator to complete the flagship portfolio of the home appliance products by PT. Panasonic Gobel Indonesia. 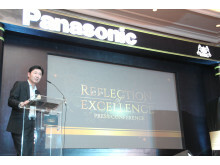 The product launch is still part of the 55th anniversary celebration of Panasonic’s contribution in Indonesia. With high-class appearance and its advanced technology that differs the fridge from its similar products, the model as well as the quality of this refrigerator have been adjusted to Japanese standardization, which makes it an exclusive product that does not only offer excellence but also durability. “We see that consumers of home appliances in Indonesia are very dynamic and have grown rapidly. It is undeniable that their standards for a product have escalated and are looking for added-value in every product that they purchase. Therefore, Panasonic from time to time renews the display as well as the technology of the products to answer the consumers’ specific needs, and a way to address this demand is by introducing the Panasonic Glass Door Refrigerator that we launch today,” stated Mr. Hiroyoshi Suga, President Director of PT. Panasonic Gobel Indonesia. The transparent glass doors of this refrigerator comes in a flat shape without any curves, which makes the cleaning process even easier without leaving any stains. Refrigerators that are currently and widely distributed in the market still have a handle on the front part of the fridge. The Panasonic Glass Door Refrigerator appears with its new shiny handle model to maintain the flat appearance of the full-flat doors. Additionally, the choice of glass material has a purpose to maintain its extra durability against scratches and movement, so its curvy design at the outer part of the fridge lasts longer. This stylish and sophisticated refrigerator design comes in three elegant colors, which are are Jet Black Jet, Red Wine and Blue Gallant. This two-door refrigerator has an AG cleaning function that serves as an anti-bacterial that can drastically eliminate bacteria inside the refrigerator. The AG clean does not only guarantee a stronger anti-bacterial function to keep food and beverage inside the refrigerator, but it also eliminates odors or smell that comes from fish or vegetable utilizing its double deodorizing system. The Panasonic Glass Door Refrigerator has a bigger capacity. With its twin jumbo concept, the fridge has a bigger space for the freezer and vegerator, in which users can store more food and beverage to be served cold or can can increased the life expectancy of food and ingredients stored in the fridge.The volume capacity of the Freezer is a super big freezer of 53L, while the vegerator box reaches 72L. Aside of its commitment to deliver the best products possible to the market, Panasonic also takes active participation in promoting the use of advanced technology that produces highly qualified, eco-friendly products. A way to address the eco-friendly technology is the use of micro-computer technology that saves energy up to 26% compared to other similar products. 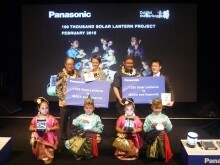 “In the making of the product, Panasonic did not only consider its advance technology to provide benefits and ease for the users, but we also reviewed whether the technology was safe and environmentally friendly. With this product, we also encourage our consumers to show more care towards the environmental impact by using eco-friendly home appliance products,” added Frangky Purnomo, Product Manager Home Appliances PT Panasonic Gobel Indonesia. The many advantages and benefits offered by this exclusive refrigerator can be obtained in October 2015. Through this product, Panasonic wishes to meet the consumers’ needs that reflect their smarter way of choosing a product that does not only address their needs, but also has an added-value and extra benefits when being used. Particularly for a household need that does not only provide benefits for the buyer, but also to their family. Moving forward, Panasonic will keep innovating products adjusted to the changes of the increasing needs of the consumers. Through its brand which generally known by the name of Panasonic, with headquarters in Osaka, Japan, Panasonic Corporation is a world-class manufacturing in the field of electronic products, in particular the need for consumers of the layman, business and industry. 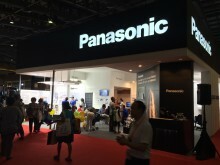 In Asia Pacific, Panasonic appears first by setting up its first factory in Thailand in 1961. The next few years, Panasonic operations in this area are growing which currently operating in 9 countries (including Indonesia) with a total of 75 companies employing more than 82,000 people. In Indonesia alone, the Panasonic has a very long history and embedded in the hearts of all the people of Indonesia. Starting with a radio presence 'Tjawang' by the late Drs. Thayeb H. Moh. Gobel in 1954, the first TV in 1962, the presence of National brand in 1970, until eventually change the name of National and Panasonic use the name in 2004. Until now Panasonic in Indonesia remains the most leading electronics brand with a series of innovative products , ranging from plasma TVs, cameras, air conditioners, refrigerators, washing machines, and more. For more information on Panasonic, please visit our website at www.panasonic.com/id or call our Customer Care Center at 62-21-8009494. Experts forecast Asia’s economic and retail growth will continue to soar over the next few years, and with it a demand for premium home solutions. Here are some that are meeting the rising needs of this market.